Is Your eLearning Effective for Dummies? I recently started teaching myself how to play harmonica with the help of a book from the For Dummies series. And I'm impressed. These guys are good instructional designers. That said, I realize that the point of these books is to instruct. But that's the point of a lot of books, and not all of them do it well. So kudos to them. What, exactly, are they doing right? Am I doing those things right when I design an eLearning lesson? As I started to sputter out a few tunes on my new harmonica, I made it a point to notice the instructional tactics that were most helpful for me. Modular chapters. Each chapter begins with a concise list of what you will learn about. And while the chapters build sequentially (foundations to application, simple to complex, etc. ), they're written in a way that allows me to jump around between chapters. In my case I was eager to play, so I jumped past the foundational chapters and skipped ahead to the chapters that taught notes and simple songs. After feeling satisfied with some initial tinkering, I went back and read the earlier content on technique. Creating this type of flexibility can help initially gain attention and then maintain engagement of a variety of learners. This flexibility can work well with scenario-based eLearning. Imagine opening a lesson with a scenario or case study. Learners who like to tinker can dive in immediately, perhaps clicking "hint" buttons or accessing job aids as needed. Having the option to work the scenario right away keeps them engaged and helps avoid the zoning out that can come with being forced to read introductory information first. Learners who prefer more guidance could opt to review a job aid or a demo first. Having this route available can benefit learners who become overwhelmed when pushed into something too quickly. Everyone wins. Conversational tone. The book's friendly voice helps create a feeling of learning from a personable instructor. It's even entertaining at times. That conversational, natural language also helps make it a quick, easy-to-understand read. That means less re-reading to comprehend a sentence and more time spent learning. When you draft training materials, do they read more like a traditional textbook or a casual blog post? If you're thinking textbook, does it have to be that way? Why not make eLearning read more conversationally? Consistent visual cues. A hallmark of the For Dummies books is their consistent use of icons. I found the "tip" and "warning" icons most helpful. As I mentioned before, I was eager to just start playing. While I didn't have the patience to thoroughly read full paragraphs at first, their icons helped draw my eye to the important stuff, which helped me get rolling more quickly. I eventually went back to read the paragraphs for the sake of going beyond the bare basics. Of course, eLearning can take advantage of icons in the same way. Using them consistently (and somewhat sparingly) can help ensure that even skimming learners notice critical information. And if they need more help to perform a task or complete a scenario, even skimmers will likely delve deeper into the content as needed. So how's my harmonica playing? Well, after my first half hour with the book, I could play a mean When the Saints Come Marching In. And when I say "mean," I really mean something that's a bit off-rhythm and out of tune. Yet, surprisingly recognizable. Which I'm telling myself is a good start. If you've paged through a For Dummies book (or a similar type of series), what instructional qualities benefitted you? 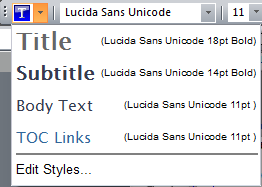 One helpful feature of Lectora that is often neglected is “Text Styles.” They provide an easy way to set the font, color, and size settings for selections of text or entire text blocks. Best of all, when a Text Style is updated, any affected text in a course is also updated. For example, if you are asked to change the page titles of an entire course from blue to green, you could do so with one quick change rather than manually fix every page. If you constantly find yourself tweaking text settings, try taking advantage of Text Styles. You may notice some similarities to CSS (Cascading Style Sheets) or the Text Styles used in Microsoft Word. However, it’s not necessary to know either. Just keep in mind that once a selection of text is associated with a Text Style, it will automatically update if the style changes. To set or change a style for existing text, first make sure the entire text block or a portion of the text inside is selected. Then from the text tool bar, click the Text Style drop-down list (down arrow to the right of the “T” inside a blue square – see image below). This pulls up a list of existing styles. From here you can select one of those, or create/change a style by clicking the “Edit Styles…” option. Text blocks always start with a Text Style. It just might not be the one you want. To change the default Text Style so that each new text block follows different font, size, and color settings, go to the course’s Title Properties under the Background tab. In the example above, the style “Body Text” is used as the Default Text Style throughout the entire title. Any new text block will automatically use that style’s font, size, and color settings. Clicking the “Styles…” button pulls up the same Text Styles window as the “Edit Styles…” option where styles can be created or changed. If the Body Text style changes, so will all the default text in the entire course. Styles you create and change are not tied to a specific course. Instead, styles are tied to a PC’s user preferences. Other Lectora developers will only see their own styles. Although, whatever is set as the “Default Text Style” in a course’s Title Properties will be preserved regardless of whether a developer has that specific style or not. To share Text Styles between developers, Lectora provides the option to import and export Text Styles. This is much easier than trying to make sure everyone is set up with the same exact styles. If you begin to rely heavily on Text Styles and will be working on a course with other developers, saving exported styles to where everyone has access is ideal. So if you haven’t already, give Lectora Text Styles a try in your next course. Many eLearning courses walk learners through a detailed process flow within the course, and then the eLearning courses tell learners that a job aid with the same information is also available for reference later. Instead, consider directing learners to the job aid first. Teach them how to use it, prompt them to refer to it to help them solve a scenario, and provide any supporting clarification and tips as needed within the scenario's context. It mirrors the job. The research that Bob Mosher and Conrad Gottfredson synthesized into the five moments of learning need reminds us of how useful performance support (like a job aid) is at the moment that someone needs to apply knowledge. Using these same job aids to help introduce new knowledge helps reinforce the availability of job aids and how to use them. It's consistent with how we learn. The January/February issue of Scientific American Mind described the Google effect of how people learn. In short, research suggests that the internet has changed the way our brains store information - instead of remembering the information itself, we've become programmed to remember how to access information for future reference. It avoids duplicating content. If all the details of a process flow (or something similar) are already written out in a job aid, why repeat all of that content in an eLearning lesson? After all, if something changes, duplicate content means more material to update. It potentially shortens training time. Suppose an organization has a performance support site, knowledge management system, or intranet in which several job aids follow a similar structure. If training successfully teaches learners how to follow the job aids for critical tasks, they should be able to follow the same types of job aids to help them complete other tasks. As a result, you may be able to reduce the number of job tasks you need to include in an eLearning course. If you have a client who isn't convinced of this final advantage, put it to the test. Pilot an initial version of an eLearning course that focuses on referring to job aids to complete a few critical tasks. Then, assess learners' ability to complete other tasks that weren't included in training but have corresponding job aids. Do you introduce job tasks in eLearning courses with the help of job aids? What advantages have you observed? Any drawbacks? Many of us know the common scenarios. Victor has a great PowerPoint deck on the new widget. Make it available online. Sally created some great videos on changes to the old process. Post those on the corporate site. Work with Jordan to put the face-to-face training in Adobe Captivate so we can roll it out to the rest of the organization at low cost. Oh, and we don't have time to do anything elaborate! As e-learning professionals we talk a lot about how things should be done. But every day many of us bite the bullet and put something out to either satisfy a low effort request or a ridiculous timeline. Creating something more engaging takes just too much time. But, wait, that is easy to say but not exactly true. I believe it is a training issue within or own profession. Many e-learning developers simply don't feel comfortable adding engaging content on short notice. I believe this is because they are not trained to do so. Most developers I've met have picked up the trade through on-the-job-training and have no formal training in e-learning development. Further, many people charged with creating e-learning come from instructional design backgrounds and have never been formally trained on creating robust web content. So here we are, learning professionals, doing a job many of us were never trained to do. And guess what? There is no one there to train you…that is your job. And it is not an easy task. To create the most engaging training you need to be an instructional designer, a graphic designer, a web developer, and an LMS expert. On top of that you need great writing skills, attention to detail, and be great at testing and troubleshooting. You would command an annual salary upwards of $100K doing all of that! Some of us work in organizations where these tasks are split up and there is an individual that can do each of these tasks. While the specialization allows for more interesting and engaging projects, communication and team coherence are often not as strong as they could be resulting in fractured projects that are not everything they could be. And, not many projects have the flexible timeline to fit in that type of model. The more an individual can do, the quicker a project can move through the development process. So what can you do to get the skills necessary for such a demanding job? Encourage and provide formal training on web development. This can be done from a combination of online learning sites like Lynda.com, training classes at web conferences, and formal training classes by tools vendors. Facilitate sharing among team members. At weekly meetings, have team members take turns sharing something interesting they've learned in the past month. Showcase projects that meet the engagement standards you seek. If a project is outstanding, make sure everyone on the team sees it and understands the expectations. Give team members the time to experiment with engaging content for each project. Work it into the schedule as much as possible. They will get faster over time. Get membership to an online learning site like Lynda.com and use it on an "as needed" basis. Never say (or think) you can't do something until you have taken a training course on the topic. Involve yourself with social media like Twitter, blogs, and user groups. Follow people on Twitter that have interesting things to say. Look at the social media surrounding the e-learning product you are using and look at the examples and how they are created. Articulate has one of the best social media networks for this. Learn advanced actions and variables, practice with them, and use them in projects. Become comfortable with them. They are key to providing "outside the box" engaging content. Create an e-learning playground on your computer to practice and hone the skills you learn. If you get an idea but don't have a project for it, create a playground project and save it there. How have you improved your skills for creating great, engaging e-learning?